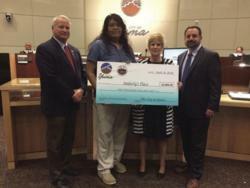 The Quechan Tribe and the Yuma City Council distributed nearly $9,000 in gaming proceeds to nonprofit organizations during the regular meeting held April 18. Under compacts with Arizona, tribal casinos contribute a percentage of their gaming revenues each year to cities, towns and counties, who in turn choose nonprofit community organizations as the beneficiaries. The Quechan Tribe operates two gaming facilities in Yuma County. The latest statistics for Amberly’s Place show a decrease in the number of secondary victims in March. Secondary victims are those closely affected by the abuse although they might not have been abused directly, such as children who witness a parent being abused. 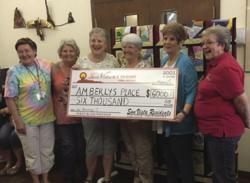 Sun Vista Piece Makers have donated over $43,155 to Amberly’s Place since they began around 14 years ago. This season, Shirley Jones (from left), president; Terri Williams, activity director; Ann Crain; Judy Rushford; and Dusty Grooms (far right), park manager; presented a $6,000 check to Diane Umphress (second from right), executive director of Amberly’s Place. There are 108 registered quilters at Sun Vista and at least 70 quilters who meet regularly during the classes every week. 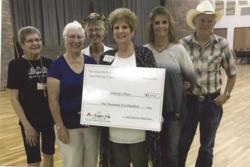 The line dancing group of Sun Vista RV Resort presented a $1,500 donation to Dianne Umphress (center, holding check), of Amberly’s Place. From left are Carol Durbin, Betty Swoverland, Jeannie Price, and line dance instructors Kay and Montey Anglen. 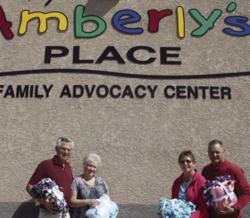 Over 70 residents of the Palms RV Resort lovingly made 110 fleece blankets this season in hopes they will bring warmth and comfort to the recipients of Amberly’s Place. The blankets were presented by Barrie and Janet Penrice (from left) and Karen Samson, representatives of the resort, to Christian Segura (far right), forensic interviewer/trainer at Amberly’s Place. So far this year, the center has served 2,209 primary and secondary victims, including the following cases: 60 physical child abuse, 108 sexual child abuse, 600 domestic violence, 140 adult sexual assault, two bullying, six assault/threats, five elder abuse, five stalking, one harassment and seven homicides/attempted homicides. PHOENIX, Ariz. - “The window had been my companion, a promise of a world safe on the outside the window was my hope of help on the other side," an emotional account of domestic violence from Arizonan Brianca Miller, heard by the governor and countless others, gathered in front of the Arizona Capitol building Monday night to commemorate the start of Domestic Violence Awareness month and to light Arizona purple. It’s an issue the state says will affect 1 in 4 Arizona women in their lifetime.